Aromatherapy has been around for thousands of years. Hippocrates studied the use of herbs and plants with massage in order to promote healing, and the first use of aromatherapy was recorded more than 3,500 years ago. Distillation of plant and flower extracts were used in medical therapies in ancient cultures all over the world. There are two main ways in which aromatherapy can be used for healing. The main method, of course, is through scent. Scientists now know that the brain is awakened and affected by aromas. Scents can stimulate our emotions in a variety of ways. This is because the portion of our brain that processes scent is connected to the part that processes emotions. When one is stimulated, the other reacts. So, when a person inhales a soothing scent like lavender oil, they receive an emotional trigger to relax. Aromas affect our feelings, moods and emotions. The second aspect of aromatherapy has to do with the touch. Aromatherapy can include massaging essential oils into the skin to help your body stimulate blood flow and break down toxins. This, in turn, improves your health and well-being. At Privy Skin Care we offer both an aromatherapy facial and and an aromatherapy back treatment. Adding essential oils tailored to your specific needs and skin type to our specialized treatments provides you with the utmost in health and relaxation. Why not get a jump on the upcoming holiday stresses by scheduling a DeStress Me facial or Ultimate Aromatherapy Back Treatment? Our DeStress Me Facial begins with basic deep cleaning and pore softening but also offers a soothing massage of the neck face, décolleté, shoulders and upper back. This treatment is combined with the euphoric aromas of doTERRA essential oils so two of your strongest senses—touch and smell—can work together to help you become a more relaxed, vibrant you! Ultimate Aromatherapy Back Treatment: The ultimate relaxing back facial using doTERRA essential oil. 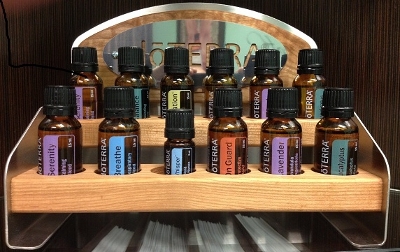 Based upon your needs I will custom blend doTERRA oils to achieve your desired results. This ultimate back treatment consists of cleansing, exfoliation, extractions if needed, massage of the back, neck, shoulders, arms, hands and feet, mask, toner and moisturizer. The ultimate stress reducer!